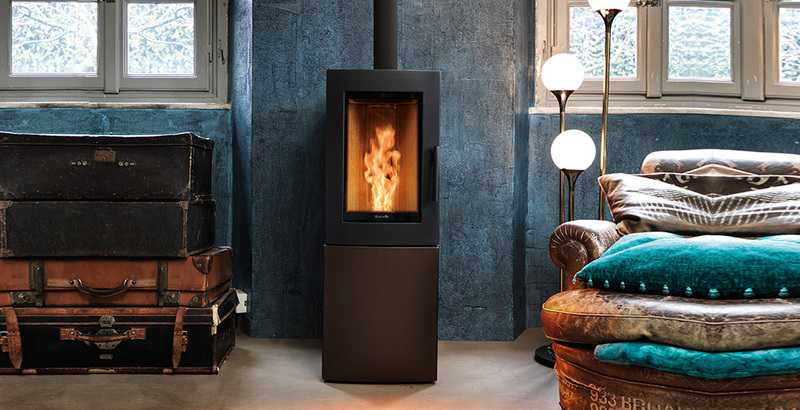 The Alfa S wood pellet stove stands out with its clean straight lines. The Alfa S wood pellet stove stands out with its clean straight lines. This is achieved by steel side covers along with solid cast iron door and top. It is a silent, natural convection stove enabling the heat to be more evenly distributed around your room. The stoves 25Kg internal hopper means it can run for up to 26 hours from a fill of pellets. In addition, thanks to the new burner the pellet stove has a more natural flame which is almost impossible to distinguish from a wood stove. Cleaning is simplified thanks to a self-cleaning grate which empties automatically into the ash pan needing only to be emptied every 30 days or after 150Kg of pellets burnt. With its adjustable power settings the Alfa S is ideal for small to medium sized rooms up to 155mt³. It is fully adjustable in terms of time and temperature, so your room will always be warm at your desired time; The Alfa S is available in two colours and comes standard with touch remote control.